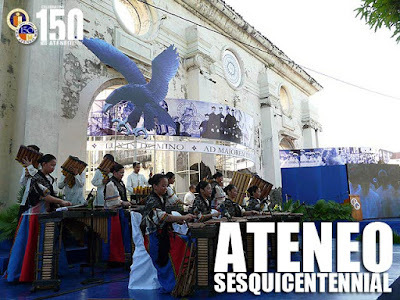 Last Sunday, the Ateneo de Manila University opened festivities marking its sesquicentennial or 150th anniversary. The celebrations could have been bigger with student participation but had to be toned down because of the A(H1N1) situation. But the events were meaningful and grand nonetheless. 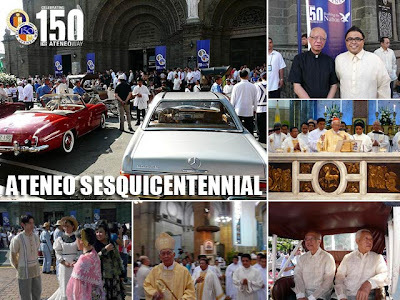 The whole day was actually a motorcade that started in Intramuros, the orginal site of the Ateneo, ending at the current campus in Loyola Heights. It started with a High Mass at the Manila Cathedral celebrated by His Eminence Gaudencio Cardinal Rosales and a battalion of Jesuit priests. This was followed by a procession from the Cathedral to the ruins of San Ignacio Church and the original site of the Ateneo de Manila. It was in 1859 that the City of Manila handed over control of Manila's only primary school, the Escuela Municipal de Manila, to the Jesuits, who had returned to the Philippines on June 14, 1859 after nearly a century of absence. As a side note, had the Jesuits not been suppressed and expelled from the Philippines in 1768, the oldest school in the country would have been the Colegio de Manila which was founded by the Jesuits in 1590. It was made the Universidad de San Ignacio by Pope Gregory XV in 1621, and the first royal and pontifical university in the Philippines and in Asia in 1732. The Escuela Municipal de Manila formally opened its doors on December 10, 1859. 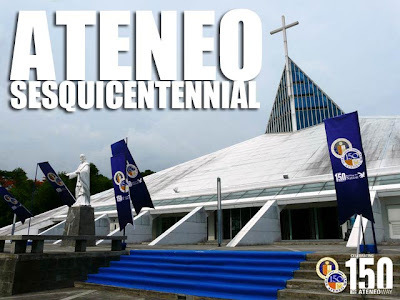 In 1865, it was renamed Ateneo Municipal de Manila after it was accredited as an institution for secondary education. 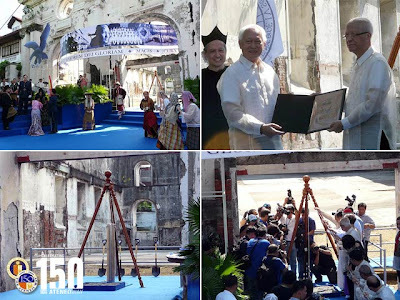 Anyway, we all trooped to the San Ignacio Church to witness groundbreaking ceremonies for the reconstruction of the church and its Casa Mision which will house the Museo de Intramuros. That's right, the three-storey Casa Mision will be reconstructed to house the priceless relics and artifacts that have long been in storage in the offices of the Intramuros Administration. The ultimate dream is to rebuild the San Ignacio Church, arguably the grandest of all Intramuros churches! 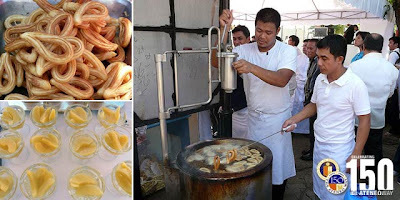 After the program, we were served a traditional 19th century Ateneo breakfast composed of churros con chocolate, melocotón (peaches) and pandesal. A fire destroyed the Intramuros campus in 1932. The school thus transferred to Padre Faura Street in Ermita. And this was the second stop of the motorcade. A marker was unveiled at the entrance of what is now Robinsons Place as a reminder that the Ateneo campus once stood there. The Padre Faura campus, together with the San Ignacio Church in Intramuros, were destroyed during World War II. The motorcade also passed by the old Salcedo Campus, the Ateneo Professional Schools at Rockwell, and the School of Medicine and Public Health in Ortigas before finally making its way to Loyola Heights. The motorcade was welcomed at the Church of the Gesu with cheers from the Blue Babble Batallion. The day finally ended with a concert by the Ateneo Chamber Singers, the Ateneo College Glee Club and some more talents at the Gesu. But the absence of most of the students was felt. So I hope in December, when we hold the One Big Night, no A(H1N1) will dampen the celebrations! But thank God for giving us a sunny Sunday! It was done AMDG ( AD MAJOREM DEI GLORIAM)!!!! 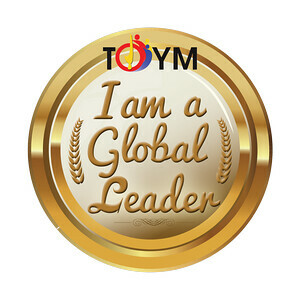 For the GREATER GLORY of GOD!!!! It is exciting to know that a new museum will rise from the ruins of Casa Mison. It is more exciting if they reconstruct the church of San Ignacio complete with the Ystilo Tampingo interior. Its good that the old church hath been rebuilt and be consecrated once more. I even hope that there's an annex of the Ateneo Campus in Intramuros to revive what the MANILA in Ateneo de Manila was ...and is. “We will reconstruct San Ignacio as the Museo de Intramuros to house the over 2, 000 items of religious images in wood and ivory… those chalices and silver altars belonging to the Intramuros Administration and excavated artifacts from this site will likewise be exhibited to further shed light to the origins of the city,” Harper said during the groundbreaking ceremony for the Museo de Intramuros yesterday. If not, has there been a date designated to begin the reconstruction?